Ashes to ashes, there's life after death! Ashes to ashes, then into vinyl! Is there life after death? Do you believe vinyl is here to stay and will survive forever? If you're a true vinyl lover the answer is YES! 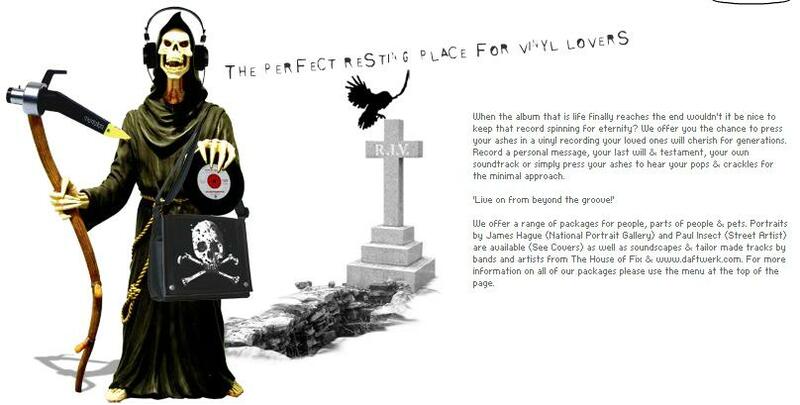 If so, let me introduce you to And Vinyly, the “perfect resting place for vinyl lovers”. And vinyly is a Company, apparently based in the UK, that presses your ashes into a vinyl recording, together with your favourite music, messages, and last will and testament! This service can be as basic as it gets i.e. no music, just the pops and surface noise generated by your ashes pressed in the LP or can be custom tailored to satisfy all your needs: from fancy LP covers to vinyl distribution worldwide. You can have your ashes spinning worldwide on audiophile turntables equipped with Mortofon cartridges (see pic on the And Vinyly website! ), perhaps even at HiFi Shows, if you choose some good audiophile track to be recorded. The basic package included 30 copies of your “final” LP, with LP cover and labels, all for 3000 UKP. Not sure which kind of music to press? You might decide to have some “personal” track written just for you and then pressed in the post-mortem LP, but please note that each new track will cost you an additional 500 UKP. If you don't like the idea of being cremated, you can decide to “store” just one body part (you decide! Size doesn't matter, right? ), cremate that and build your LP with the resulting ashes. The “service” is also available for pets (costs are the same, though). The website also sells records (“Death to vinyl records”) and merchandising (T-shirts etc.). The most hilarious section of the And Vinyly website are the following “10 steps to immortality”...do not forget step 6, of course!!! Now, what's next? We've already seen audiophile coffins, do you remember the ones manufactured by CataCombo Sound System? (now apparently out of service), so we might expect anything! Perhaps someone will build HiFi cables using your ashes as the ultimate dielectric, for example. This way, as the And Vinyly guys say: Live on from beyond the groove!. As a musical suggestion, just in case you decide to go for the And Vinyly services, please consider this brilliant track from Faith no more, “Ashes to ashes” from their Album of the Year - 1997 - (no, it is not a cover of Bowie's song).